Interested in a great deal? 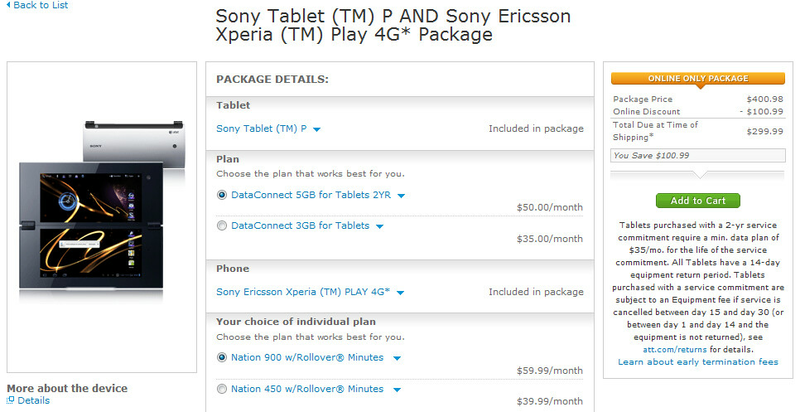 AT&T is offering both the dual-screen, clamshell Sony Tablet P, with Android 3.2 aboard, and the PlayStation certified Sony Ericsson Xperia PLAY 4G in a bundle deal for $299.99. While that is certainly a significant savings, the carrier is requesting that you sign a 2-year contract for each device. Still, you have to keep in mind that the Sony Tablet P alone has a $400 to $550 price tag depending on whether or not a 2-year contract was executed by the buyer. Looking at the specs on each device, we will start with the Sony Tablet P with the unique (for a tablet anyway) clamshell form factor with a dual screen. Opening the device reveals a pair of 5.5 inch screens, each with resolution of 1024 x 480 and a pixel density of 206 ppi. The tablet is powered by a dual-core 1GHz Tegra 2 processor with 1GB of RAM. A 5MP rear-facing camera supports video at 720p and there is a front-facing VGA camera for self-portraits and video chat. We haven't looked at the Sony Ericsson Xperia PLAY 4G for some time, so don't be shocked by the specs. The handset has a 4 inch screen with resolution of 480 x 854 and a pixel density of 245 ppi. Under the hood is a single-core 1GHz Scorpion ARMv7 with an Adreno GU graphics processor. There is 512MB of RAM on board and a 5MP camera on back that takes 720p video. There is a front-facing camera and Android 2.3.3 is installed. Still looking good considering its age. If you are a Sony fan, this deal is tailor made for you. And even if you are just looking for the Tablet P at a great price, you are saving up to $250 bucks with the bundle and getting the smartphone thrown in for free. As long as you don't mind signing on the dotted line for the 2-year pact on both devices, this bundle could be a great deal. Lol... my phone has more horsepower than that tablet. How much is that tablet anyway? Because the play is free when you sign up. 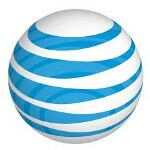 AT&T it's not going to sell unless u give US OUR UNLIMITED DATA BACK so give it up already. I'm getting the WIFI versio only. they haven't been losing subscribers since they removed unlimited data. They have no real incentive to bring it back. sorry but unlimited data is gone.